Several reports appearing in July indicate that Christian minorities all around the Muslim world—especially women and children—are being abducted, tortured, raped, forced to convert to Islam, and/or enslaved. 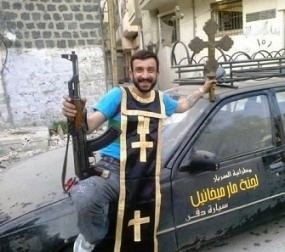 A member of the US-supported Free Syrian Army mocks Christianity by posing in a stolen cleric garment, holding a looted cross from a nearby destroyed church in one hand and a gun in the other, and standing in front of a church funeral car, suggestive of a death threat. Categorized by theme, July’s assemblage of Muslim persecution of Christians around the world includes (but is not limited to) the following accounts, listed in alphabetical order by country, not severity. Iran: Both the Central Assembly of God Church in Tehran and its summer campsite—once a popular site for Christian gatherings and conferences—were closed by authorities of the Islamic Republic, who also posted a large notice on the gates “warning of severe consequences should anyone try to enter the premises.” These latest closures follow the official termination of Friday Persian language services and the compulsory cancellation of all Bible classes and the distribution of Christian literature. Also, as part of the crackdown on house churches, plainclothes agents of the Ministry of Islamic Guidance continued raiding, arresting, and “aggressively interrogating” assembled worshippers. Lebanon: Ahead of the Maronite Patriarch’s visit to Akker, flyers signed by the “Soldiers of the Great Prophet” made anti-Christian threats in what has traditionally been the safest Mideast country for Christians, calling “on the infidels to stop their blasphemy … We will start from the infidel’s church in Akker and we won’t stop … this is not the end but the beginning,” read the flyer. Kenya: Seven Islamic jihadis launched simultaneous grenade and gunfire attacks on two churches while the congregations were at prayer. Five militants attacked the Africa Inland Church, killing 17 people and wounding approximately 60, including many women and children; two other Muslim terrorists attacked the nearby Catholic Church, wounding three. Turkey: The existence of the oldest functioning Christian monastery in the world, 5th century Mor Gabriel Monastery near the Turkish-Syrian border, is at risk after a ruling by Turkey’s highest appeals court. Inhabited today by only a few dozen Christians dedicated to learning the monastery’s teachings, the ancient Aramaic language spoken by Jesus and the Orthodox Syriac tradition, neighboring Muslims with the support of an MP member of the Islamic Justice and Development Party (AKP) filed a lawsuit accusing the Christians of practicing “anti-Turkish activities” and of illegally occupying land which belongs to Muslim villages. The highest appeals court in Ankara, which is close to the government, ruled in favor of the Muslim villagers, saying the land that has been part of the monastery for 1,600 years is not its property, and even claimed that the monastery was built over the ruins of a mosque—even though Mohammed was born 170 years after its foundation. Egypt: A Christian teacher was arrested and detained after being accused of posting cartoons insulting to Islam and its prophet on Facebook. The man faces up to five years in jail if convicted of blasphemy. While admitting he manages the site in question, he said the site was hacked. Earlier in April, a Christian teenager was sentenced to three years in prison for posting cartoons perceived to mock Islam’s prophet on his Facebook page. Likewise, Christian business tycoon Naguib Sawiris posted Disney’s Mickey and Minnie Mouse dressed in Islamic attire, which landed him in court, though he was later acquitted. Pakistan: A Christian couple continue to be on the run since they embraced Islam back in 2006, only to reconvert to Christianity. Upon learning that the couple returned to Christianity, neighboring Muslims attacked and persecuted them; one of the husband’s best friends abducted and tortured him, while beating the wife. “[One] should have the freedom to choose the religion one wishes to follow,” said the Christian husband. Saudi Arabia: A court is looking into an apostasy case concerning a 28-year-old Muslim woman’sconversion to Christianity. The father alleges that a Saudi and a Lebanese played a role in converting his daughter to Christianity and smuggling her to Lebanon, where she has received sanctuary in an anonymous church. Nigeria: In what is being described as an ongoing genocide of Christians, over 65 people, including two politicians, were killed in triple attacks on Christians. First, Muslims destroyed 43 Christian-owned farms. Nobody was arrested. Then they attacked nine Christian villages around the city of Jos, killing dozens of people. “They came in hundreds,” said an official, “Some had police uniforms and some even had bulletproof vests.” In one instance, Christians fleeing the violence took refuge in the house of a local church leader, which was bombed and more than 50 Christians were burned alive, including the pastor’s wife and children. Then the Muslims attacked the funeral for the victims of the village raids, killing several more people. Security forces said Muslim Fulani herdsmen were responsible but Islamic militant group Boko Haram issued a statement saying “We thank Allah for the successful attack.” Separately, Islamic motorcycle assassinsgunned down four Christians. Turkey: An article titled “Who Ordered the Murder of Christians?” asserts that a Muslim undercover agent who had worked for the government “penetrated the Christian community and gathered a lot of information, while he was pretending to be a missionary. He became a church leader, and upon receiving another order, he became ‘Muslim’ again and launched a campaign against missionaries across the country,” which culminated in the massacre of Christians. Egypt: After a Christian laundry worker burned the shirt of a Muslim man, several quarrels ensued and culminated with the death of a Muslim. Accordingly, thousands of Muslims rampaged the village, causing 120 Christian families to flee. They looted Christian businesses and homes “despite hundreds of security forces being deployed in the village. Eyewitnesses reported that security forces did not protect most Coptic property.” Family members of the deceased Muslim insist that the Christians must still pay with their lives. Also, during Ramadan, several Christians were attacked and beaten. Dr. Yassir al-Burhami, a prominent figure in Egypt’s Salafi movement issued a fatwa forbidding Muslim taxi-drivers and bus-drivers from transporting Coptic Christian priests to their churches, which he depicted as “more forbidden than taking someone to a liquor bar.” And a charitable medical center that performs free heart operations on both Muslim and Christian children is under threat from some Muslims, who want it closed down because it was founded by a Christian surgeon. Intrinsically, to document that which the mainstream media does not: the habitual, if not chronic, Muslim persecution of Christians. Instrumentally, to show that such persecution is not “random,” but systematic and interrelated—that it is rooted in a worldview inspired by Sharia.